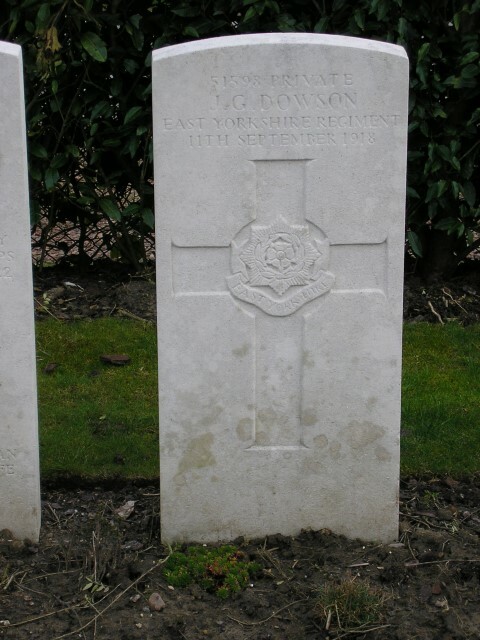 51598 Private John George Dowson, 1st Battalion, East Yorkshire Regiment was killed in action 11 September 1918 and is buried in Honnechy British cemetery, France. He was 19 years old and is commemorated on the Cockfield War Memorial, the Memorial Plaque in Cockfield Methodist Church and the Roll of Honour for Cockfield Council School. Also Edward John Thompson aged 3 (step-son) born Dinsdale, Co. Durham was recorded on the 1911 census. In 1901, the family lived at Copley Bent and by 1911 they lived at Fell View, Cockfield. Joseph worked as a coal miner (hewer). John George was still at school. He attended Cockfield Church of England School then between 14 January 1907 and 20 December 1912 attended Cockfield Council School and left upon reaching 14 years old. John George Dowson enlisted at Sunderland and joined the Northumberland Fusiliers being given the regimental number 78815 and at some time later was transferred to the 1/East Yorkshire regiment being given the regimental number 51598. He did not enter France until after 31 December 1915. Without researching Private J.G. Dowson’s service record it is impossible to know when he was transferred from the Northumberland Fusiliers to the 1/EYR and in which engagements he took part. Private John G. Dowson died 10 September 1918 in action which followed the Second Battle of Bapaume, 31 August to 3 September 1918 and prior to the Battle of Epehy which commenced 18 September. These were major battles in which the 21st Division was involved. It is clear that the advance of the Allied forces was a bloody affair and stout resistance was experienced throughout the battlefields. Fighting which took place 9 and 10 September 1918 appears not to have been given any official recognition as a battle but nevertheless was an engagement in which many lives were lost. 7 September: 1/EYR arrived at Sorel le Grand. 15/DLI moved up east of Manancourt. 8 September: 1/EYR rested during the morning. A message was received that 1/EYR may be placed at the disposal of 62nd Brigade. 15/DLI assembled for an attack on Chapel Hill and 9/KOYLI to attack Lowland Ridge. 1/EYR held in reserve. 9 September: attack made by 15/DLI and 9/KOYLI. By noon, Chapel Hill was not taken. At 2.45pm “B” and “C” Companies, 1/EYR were ordered to take up a position as “counter attack reserve.” Chapel Hill was defended by a redoubt and 15/DLI came under heavy machine gun fire which made further progress impossible for a while. In the evening the trench was taken but a German counter attack forced 15/DLI to withdraw. By 10.30pm 1/EYR assembled as follows – battalion HQ at position W.15.b.69, “A” and “B” Companies were in the sunken road at W.9.b & d, “C” Company was in trench W.9.b.83 to W.9.b.central and “D” Company was in the road about W.9.d.79. 10 September: 4am, barrage commenced. “B” Company on the right, “C” Company in the centre and “D” Company on the left. Later dispositions: “C” Coy on the left; “D” Coy on “C” Coys right; then 9/KOYLI along Lowland trench; “B” Coy 1/EYR then 15/DLI to its right along Cavalry Support Trench with “A” Coy in reserve. 11 September: 1/EYR rested and re-organised. 1/EYR lost 51 other ranks killed 10 September and 3 other ranks died 11 September including Private J.G. Dowson. 15/DLI lost 1 officer and 19 other ranks on the 9 September and 21 other ranks on the 10 September. “The Durham Forces in the Field 1914-18” Capt. W. Miles 1920 p.324 – 325.